Featuring log cabins with full kitchens and free Wi-Fi as well as and on-site hiking trails and a hot tub the North Forty Resort is a cozy getaway on 40 wooded acres near Glacier Country's most popular attractions. The North Forty Resort features 20 single-story log cabins with full kitchens handcrafted log furnishings down bedding and gas fireplaces to cozy up to after a day exploring the surrounding mountains. 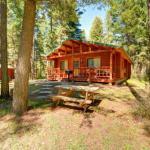 Cabins are also equipped with cable TVs phones with free local calls and free Wi-Fi. The resort offers free DVD rentals so you can enjoy a movie in the comfort of your room. Soak sore muscles in the two outdoor hot tubs or melt away stress in the sauna. The on-site nature trails are perfect for a summertime stroll or a wintertime cross-country ski. A limited number of pet-friendly cabins are available. Park right outside your cabin for free. Non-smoking cabins are available. The North Forty Resort is on 40 forested acres on Highway 40 21 miles from Glacier National Park and spectacular Going-to-the-Sun Road. Downtown Whitefish five miles away has lots of top-notch restaurants galleries and boutiques. The many bars lining Central Avenue feature music from local bands and gambling if you're feeling lucky. The resort is 12 miles from the slopes of Whitefish Mountain Resort where the views from the top are well worth the price of admission. Golfers can take a swing at Meadow Lake Golf Course three miles away Whitefish Lake Golf Club five miles away or Iron Horse Golf Club six miles away. The resort is four miles from the Whitefish Amtrak station and six miles from Glacier Park International Airport.